Having an organized pantry is the first step to organizing your kitchen. There are a few quick steps that’ll help you love your pantry again. 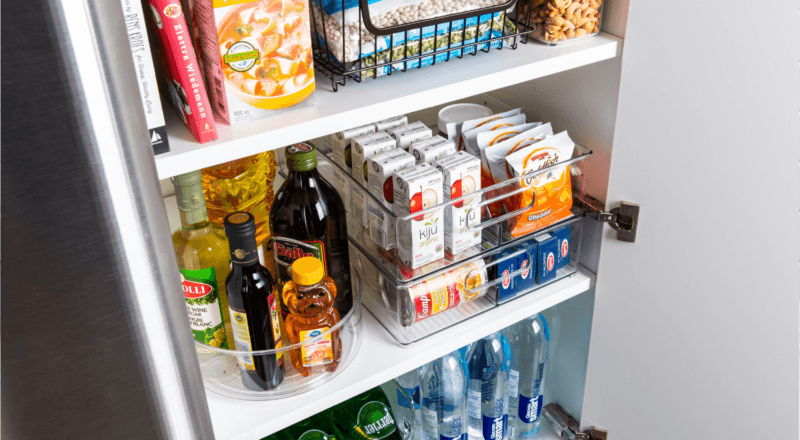 Keep reading to learn the 5 benefits of having an organized pantry, with our favourite hacks that make it super easy. We all know that kitchen real estate is hard to find. 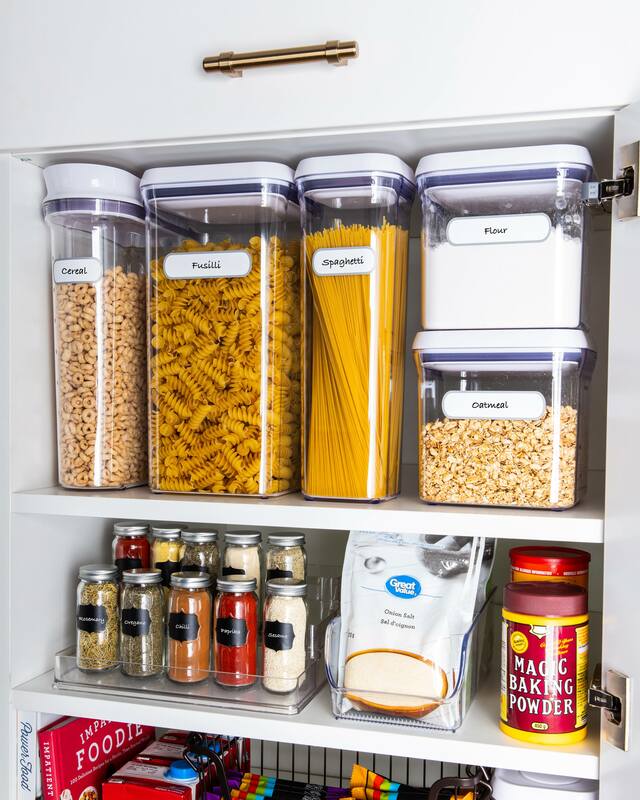 Organizing your pantry to its full potential will help free up space and keep your counter clutter-free. It’s easier than you think to get started. All you have to do is empty your pantry, measure the height and width of your shelves and make a list of the items you use most often. Once you have the right organizers, bins and baskets in place, your entire pantry will be personalized based on your family’s needs. Skip rummaging through your cabinet and make your entire cabinet (yes, that includes the very back!) easily accessible. Turntables (or “Lazy Susans”) let you sort items like condiments while tiered shelves let you take advantage of your pantry depth. It’s especially useful to add a turntable to your top shelf – no more reaching to the very back of the shelf. Find exactly what you need with an easy turn. When you know what you have in your pantry, it’s easy to keep track of what you need and don’t. AKA, no more guessing whether or not you have that ingredient SOMEWHERE in the kitchen. Dedicating a spot for all your non-perishable goods will save you from wasting money buying unnecessary ingredients. Sounds easy enough, right? Having a grocery list that’s easily accessible will help you keep track of when you’re running low on staple items. Leaving it in your pantry will remind you to add it to your list as soon as you notice it too. Get rid of pantry bugs. Yes, I said pantry bugs. These small bugs are attracted to scents like packaging glue and can be living in your half sealed bag of pasta. Using canisters instead of the packets and original packaging will help extend your food’s shelf life. TIP #3 💡: Use labels to keep track of expiry dates and products. Never worry about whether or not your food has gone or being able to tell the difference between your all purpose flour and pancake mix. Labels make it easy to clear out old items that have expired and prioritize ingredients that you gravitate towards. It’s much easier to wipe down surfaces when everything is organized neatly in the pantry and cupboards. Counters are left clutter-free so all you have to do is wipe and clean. 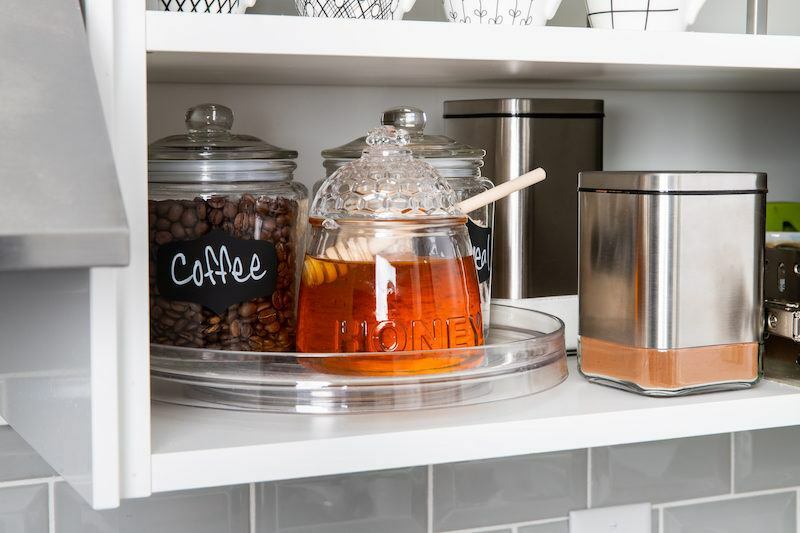 Canisters are the perfect way to organize your pantry, as they help you create structure and make it easy to find what you’re looking for, every time. Mix and match with brands you love to store exactly what you need. Styles come in a variety of shapes and sizes, too. Knowing what you have in your pantry lets you mix and match ingredients. You’ll be able to try new recipes or create brand new ones for you and your family to enjoy. Having your go-to ingredients in a space that is easily accessible will save you time and give you an extra push to cook more. If you’re an avid baker, keep staples like flour and sugar at eye level instead of at the very top or bottom. 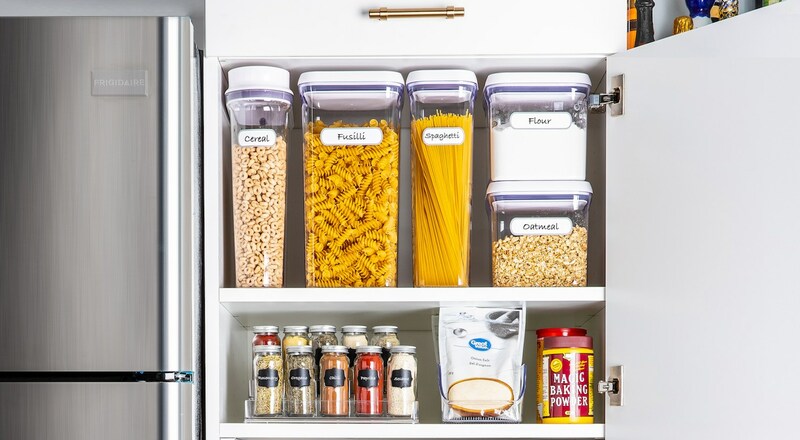 Looking to organize your entire kitchen? Here are 5 Benefits of an Organized Kitchen or get space saving ideas to organize your fridge.